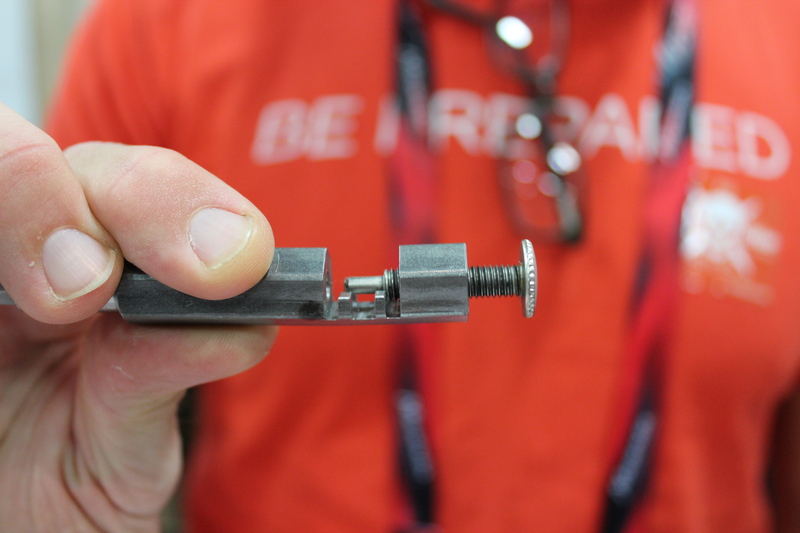 We stopped by the Fix It Sticks booth at Interbike to see what this new tool was all about. Brian Davis, the creator of the Fix It Stick, came up with the idea when working on his own bike with a 3-way tool and thought it would be nice to have the convenience of a multi-tool combined with the torque of a 3-way wrench. 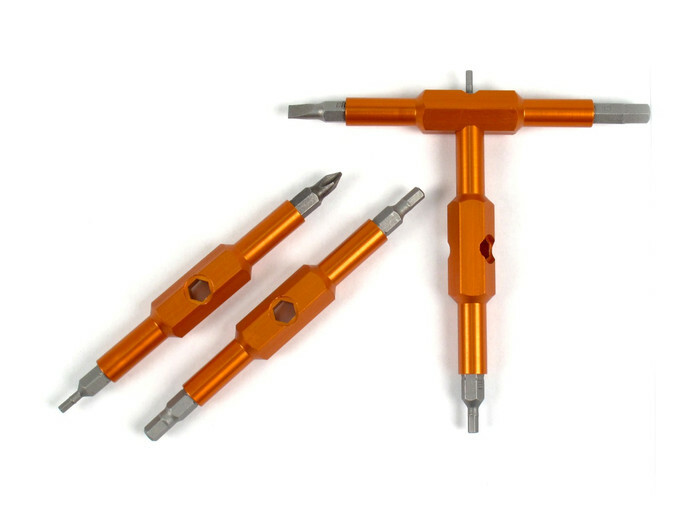 Fix It Sticks come in orange but are available in custom colors with a custom order of at least 100 sets. The simplicity of the tool increases the appeal, there are no moving parts, just two “sticks” with bits on each end. When you need to use a tool, simply place the end of one tool through the middle of a second tool. 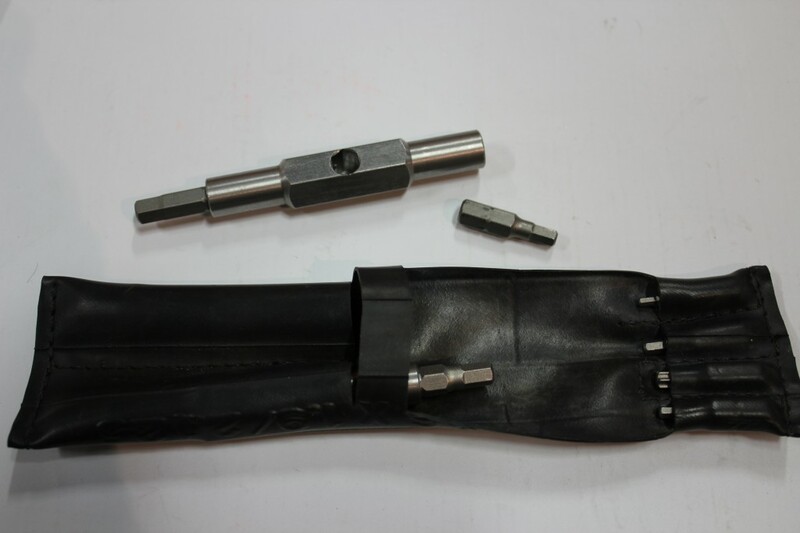 The result is a t-handle tool with which you can apply ample torque to remove or tighten the bolts on your bike. 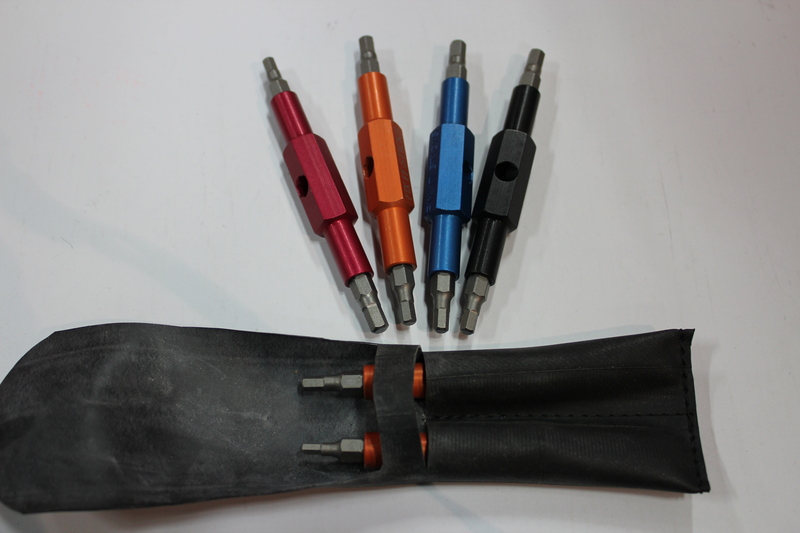 The light weight aluminum version is offers steel pressed bits and is rated at 15 newton meters. Those who are looking for a heavy-duty tool can opt for the all-steel Fix It Sticks with a torque rating of 40 newton meters. We were immediately impressed by how light this tool was. 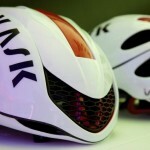 The aluminum version weighs in at around 55 grams with the steel version coming in closer to 97 grams. 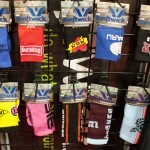 The tool fits easily into a jersey pocket and can share space with other items. The Fix It Stick also comes with a case made from recycled road tubes which we think is a nice touch. Brian is continually working on the R&D of the Fix it Sticks and has plans for a version that allows users to insert and remove different bits for even more versatility. Removable bits are in the works adding more versatility. The design of the Fix It Stick allows little more reach for tight spaces than many multi-tools offer which makes tightening hard-to-reach bolts a little less of a hassle. 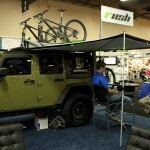 Brian, though tight-lipped on details, told us he is working on other ideas for tools as well.. Fix It Sticks come in a variety of configurations for various sports and uses. 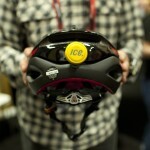 Each configuration offers various bit choices for mountain biking, road cycling, snow sports, and even home use. The sticks are modular which allows you to mix-and-match as you please. We did get our hands on our own set of Fix It Sticks and are working on a review. We will have that posted shortly. 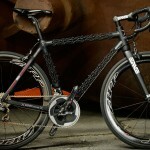 Kovit Cycles’ IsoTruss Technology, Have They Built a Better Mousetrap?